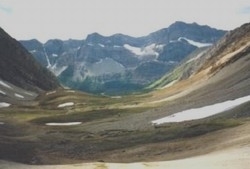 Named for: The pass is named after the badger, an animal of the foothills and prairies. The reason for the name being chosen for the pass is not known but perhaps the hoary marmot, which looks similar to a badger, was the source. This very high pass features a large cornice on the north side which lasts into September. The approach from Johnston Creek is very picuresque and gradual. The slopes on the Cascade River side are steep and scree covered. The name was made official in 1959.